This text by AMY LAM was published alongside SANDY PLOTNIKOFFS WHAT exhibition. I have a problem where when I see an iPhone 6 in public I feel attracted towards it. I want to touch the rounded corners and feel how flat it is. In other people’s selfies I look at the back of the phone to see what model of iPhone it is and feel some kind of satisfaction when I see that it’s a 6. I got one but it doesn’t give me the same pleasure as seeing a photo of it on a giant billboard, floating through a white expanse. Looking at other people using one is also more satisfying than using mine myself. I don’t know how to turn this attraction off. The button got implanted in my brain and now when I see really hi-res photos of that aluminum surface it gets pressed and I’m flooded with a rush of warm, anxious desire. It makes sense that one of single most valuable entities in the world would warp my mind and body in this way. It’s like a black hole of wealth, attracting more and more of itself towards it. Thinking about Sandy Plotnikoff’s show VVHAT helps me to process and understand this marketing power. Made out of the materials that reference capitalist surfaces–foil stamping from brand new boxes; sticky, shiny decals; paint skins–VVHAT presents a visually attractive force that is also repulsive in its effects. Viewing it is a physical experience that provokes impressed surprise (what?! is this?) but also frustration (what!! why can’t I look away). with endless definitions of where an area could begin or end. Your attention is pulled in and refracted everywhere. Moving your head slightly changes the way in which light reflects off the work, changing what you see, so you can move your head ever so slightly and see something else. There’s pleasure in this but also vertigo; to dazzle also means to blind temporarily, to deprive of sight. It’s a foil problem because it’s a staring problem. In this way, the work resembles a Bridget Riley painting. People said of Op Art that it made them want to barf; Bridget Riley hated being lumped in the genre at all. She said: “It was one that was imposed on me, one I dislike very much, because it implies an emphasis on visual tricks rather than actual perceptual experience.”¹ And it’s true–her paintings aren’t ‘tricks’, like “This grey square looks smaller than the other grey square, but it’s actually bigger… THIS is what reality is, but this is what your eyes perceive.” Instead, they illuminate the relationship between your eyes and the world around them. Her paintings, like Sandy’s foil works, create a repetitive space where you can experience the flux between mind – body – world: you get a feeling of how it is that your body actually makes meaning out of sensing. It’s not so much that you literally want to barf, but a recursive physical experience that you realize you are actually always enmeshed in. In the big collage at YYZ there’s actually a reference to something like barf: in the lower right area of the big foil work, there’s a small area of dried up paint bits stuck together in a congealed puddle. It looks like a fake barf from a joke store–not really barf, but an entertaining representation of it. Part of what makes the work so pleasurable and absorbing is how it evokes a chain of semantic associations, from the way in which certain blobs look next to each other (like barf) to the fragments of words and images (a melted bread tag or an emptied out Goodwill logo). In the Barf Manifesto, Dodie Bellamy writes about barf as an associative concept: “The Barf is an upheaval, born of our hangover from imbibing too much western civ[ilization] the Barf is expansive as the Blob, swallowing and recontextualizing, spreading out and engorging…”² It’s an expulsion as well as an agglomeration: it’s just dissolved leftovers, but also the force of all those leftovers joined together with acid and getting shot out of your body. This resonates with the exhibition–also read as Value Village Hat–as a very big collage made up of a previous gallery exhibition which showed at Paul Petro a few months before. 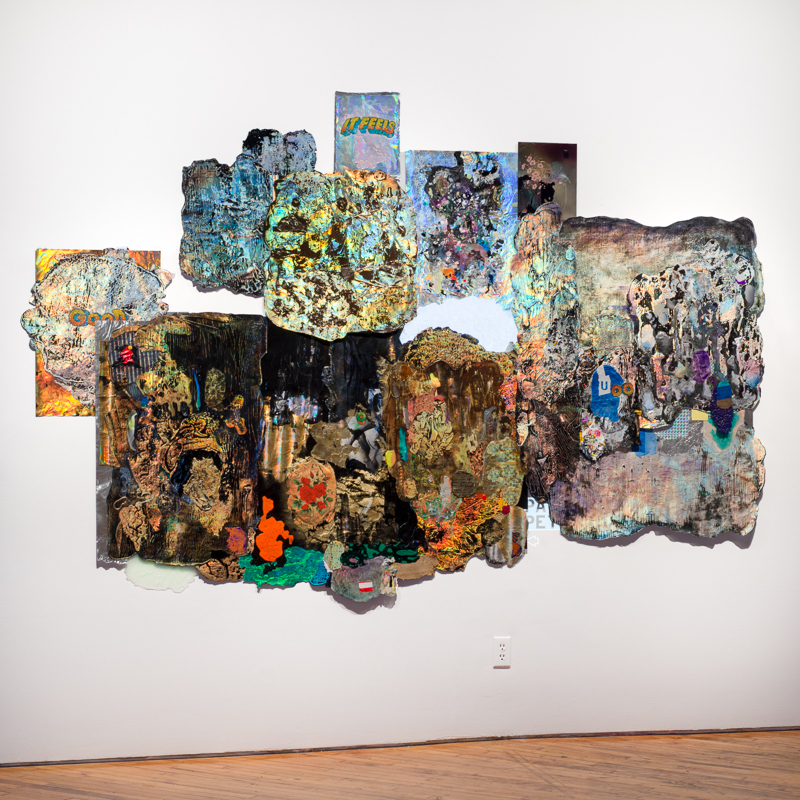 In that show there were 11 individual foil works, each itself a collage, made up of bits of foil and paint precisely adhered to larger pieces of paint or foil. At YYZ, this stickiness is magnified and turned in itself, attracting all the individual works together to make one big giant piece. Even the signage of the gallery window has been pulled off and relocated; near the bottom of the piece, a reflective version of the Paul Petro logo is stuck to the YYZ wall. It’s not totally complete though. At the entrance to the room there’s a rectangular work that’s escaped the forcefield and on the opposite wall there’s a folded silver piece perched into an opening between the wall and a ceiling, acting like it might pop out at any second to join the rest. Like all the contents of a Value Village worn as a hat, it’s a demonstration of and against gravity. I imagine VVHAT roaming the streets, sucking all the labels, decorations, surfaces, gilding, crusts, attention-grabbing whatever, from everything around it. (“IT FEELS’ got stuck to it, and then a few feet away, the reply: “GOOD.) It slimes along the promenade of a shopping centre, having the best time ever, ruining all of the brand new products on display. All of the things that usually name and demarcate an object are sucked off it by VVHAT so each object is now blank, like a blank pizza, but a blank entire Eaton’s Centre. As it moves around the world, addicted to shopping centres and thrift stores and garbage dumps, it grows uncontrollably, accumulating every possible industrial texture, color, and grade of reflectiveness. It used to have just one dangly see-through part but now it has many, and they are very big. It surpasses the height of a condo building, and then it surpasses the height of the pyramids, and then it surpasses the height of Mt. Everest. The larger it is, the more amazing and terrifying it is to look at, the more I have to look at it, and the more it shows me how to look away. 2 The Barf Manifesto in When The Sick Rule The World. Dodie Bellamy. Semiotext(e), 2015. P. 64. AMY LAM is an artist who lives in Toronto, Canada. She is from Hong Kong. She works with Jon McCurley as the performance art group Life of a Craphead. Their first feature-length film Bugs is on tour in 2016. SANDY PLOTNIKOFF is an artist in Toronto. He is represented by Paul Petro Contemporary Art and online at sandyplotnikoff.com.